Fishes migrate for two main reasons – feed and reproduce. In some cases, scientists are still unsure why fishes migrate. Fishes have been classified into two categories: Anadromous and Catadromous. Anadromous fishes are fishes that migrate from sea up into fresh water, while catadromous fishes are fishes that migrate down from fresh water into the sea. There are also diadromous fishes that refer to all fishes that migrate between the sea and fresh water. Many fishes have been known to migrate long distances daily, annually or even longer periods. These fishes travel from a few meters to thousand kilometers. In many cases, fishes migrate to feed and reproduce. Recent studies shows, they also migrate in order to avoid predators. 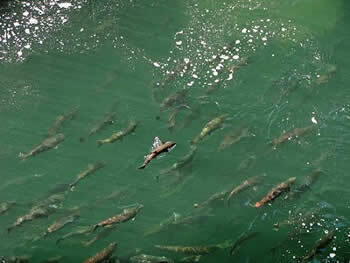 There are also forage fishes that make great migrations between reproducing, feeding and nursery grounds. Schools of a particular stock usually travel in a triangle between these grounds. For example, a school of fish could have their spawning ground in southern Norway, their feeding ground in Iceland, and their nursery ground in northern Norway. Highly migratory species include tuna and tuna-like species (albacore, bluefin, bigeye tuna, skipjack, yellowfin, blackfin, little tunny, southern bluefin and bullet), pomfret, marlin, sailfish, swordfish, saury and oceangoing sharks, dolphins and other cetaceans.